Now Moses, in the law, commanded us that such should be stoned. This past Tuesday night in my seminary class, Greek Bible & the Western Mediterranean World, I was part of a team of four that had to give a presentation on the topic of stoning in the Bible. This presentation was more of a historical description of what the event of stoning looked like rather than a theological interpretation. In this post, I will include both. This was a very interesting research project without any theological references used during the presentation. One of the books used as a reference was The Mishnah, a compilation of Rabbinical teaching and laws collected from perhaps the second century B.C. 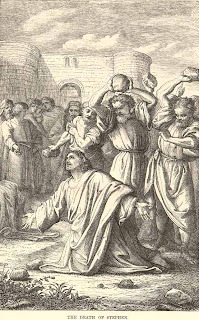 through the end of the second century A.D., which reveals to us today, a contemporary picture of the process of stoning during the times of the early church. The word stoned comes from the Greek word lithoboleō λιθοβολέω which is from a compound of lithos (lee'-thos) λίθος and ballō βάλλω to throw stones, that is, lapidate: - stone, cast stones. (Lithos - Apparently a primary word; a stone (literally or figuratively): - (mill-, stumbling-) stone. Ballō - A primary verb; to throw (in various applications, more or less violent or intense)). When we read a passage of Scripture such as the woman caught in adultery whom the scribes and Pharisees wanted to stone to death (John 8:1-11), or when Stephen was stoned for a false accusation of blaspheming God and Moses (Acts 6:11), it is helpful to understand why this form of capital punishment was instituted in the Bible. What constituted such an execution to take place and why? The purpose that runs through the entire process which led to death by stoning is that of holiness and the sanctity of the community. The LORD reminded His people many times that He was holy and therefore, they were to be holy also (Leviticus 11:45). Stoning, as a cruel and public means of execution, was meant to foster the fear of God and of His laws. Such fear was meant to focus one’s mind and heart on obedience to the LORD and as a deterrent to disobedience. Stoning, as a communal act, was a statement by the congregation (community) to rid itself of grievous sin and remain holy. It did not take place within the city so as not to defile the city and no one had to touch the corpse and be personally defiled. Blasphemy, breaking the Sabbath or not keeping the Sabbath, adultery and rebellious children all warrant death by stoning. We see and hear these exact same things in our society today by countless people and while stoning is not considered a humane form of punishment for such biblical offenses, these same people have a tremendous weight of wrath and judgment hanging over them for remaining in their sin before a just and holy God. This is the reason why Christ died on the cross as He satisfied the punishment for these offenses before God. However, such an atonement cannot be treated casually, without gratitude or disrespect either to remain unrepentant before God regarding the most gracious act of mercy He has shown toward us. “Of how much worse punishment, do you suppose, will he be thought worthy who has trampled the Son of God underfoot, counted the blood of the covenant by which he was sanctified a common thing, and insulted the Spirit of grace?” Hebrews 10:29. Customarily employed to indicate execution by stoning in OT legal texts. For example, violation of civil law as in cursing the king was a capital offense (1 Kings 21:10-15). Ceremonial law called for the execution by stoning for idolatry (Deuteronomy 13:10; 17:5). Violation of the ban on booty during holy war (Joshua 7:25). Certain types of sexual misconduct (Deuteronomy 22:21,24). Cursing the king was a capital offense that warranted death by stoning. Think of the number of people who have cursed our past and present President. In the days of the Bible, this was taken seriously for the king was to be seen as a representative of God among the people though he was not God. He was expected to perform his office with wisdom, justice and righteously before the people. Who participated in judicial process of an accused person? First, there had to be a minimum of two witnesses regarding the offense. Prior to giving their testimony before a court, they were admonished intensely reminding them they were accountable to God for any blood that was shed of a man who was wrongfully condemned. They were then examined with a series of questions by the Sanhedrin. As prescribed in The Mishnah, twenty-three judges were necessary to try a capital offense (except in the case against the High Priest or a false prophet, where 71 judges would be necessary to adjudicate the matter.) A majority of two was need for a conviction for any capital offense. The process of rendering a decision focused on the community of people continuing to be a holy people before God, which included the fear of shedding innocent blood. Hence, the concept of innocent until proven guilty. Trials and verdicts in capital cases had to be held during the daytime and a decision to acquit could be rendered on the same day. Two scribes were present during the trial – one to write down the words spoken that favored the acquittal and the other to write down the arguments for the conviction. What happened once convicted of the offense? After a guilty verdict was rendered, the condemned person was dragged some distance outside the city gate, to a pit, where the actual stoning occurred. If a woman was convicted of adultery, the stoning could likely occur in front of her father’s house as a symbol of the shame that was brought to that household and family members were to hold no compassion for them regarding their offense because they knew the commandments they were to live by. A herald would lead the procession to the stoning pit outside the city gate and his job was to announce the condemned person’s name and his or her father’s name, the crime they were convicted of and the names of the witnesses. The condemned person had an opportunity to be acquitted of their crime, up to and during the stoning execution, should someone come forth with new information that might overturn the courts decision and now find them innocent. If such a person was available with credible information, a member of the court standing by the city gate would wave two flags, signaling a rider on horseback to hurry and stop the execution and to bring the individual back to the court for further testimony that might aid in their acquittal. This could happen up to four or five times. At approximately 6 to 8 feet before the stoning pit, males were stripped of their clothes and would only wear his loincloth while a woman would remain clothed. The witnesses would lay their hands on the head of the condemned absolving themselves from the guilt of stoning the individual as a just form of punishment. The first witness pushed the individual into the pit from a height of 10 feet and if the fall did not kill them, then the witness would turn the body over, standing over the individual with a heavy stone maybe 10 or 15 pounds in weight and thrust it onto the chest of the condemned. If that did not kill the person, the second witness would approach and perform the same action with another heavy stone. If that did not kill them, then the entire congregation (community) would barrage the body of the individual with hand-size stones until they were dead. The apostle Paul said in his second letter to Timothy, “But know this, that in the last days perilous times will come: For men will be lovers of themselves, lovers of money, boasters, proud, blasphemers, disobedient to parents, unthankful, unholy, unloving, unforgiving, slanderers, without self-control, brutal, despisers of good, traitors, headstrong, haughty, lovers of pleasure rather than lovers of God, having a form of godliness but denying its power. And from such people turn away!” (2 Timothy 3:1-5). It is not hard to hear those who blaspheme the name of God or Jesus Christ, it is not too difficult to see the disobedience in children because parents have lacked in being firm in their discipline when their children are disobedient. It is not difficult to see the unholy lives of people who live openly, boasting with pride their homosexuality and calling their homosexual relationship holy before God. Woe to those who call evil good, and good evil; Who put darkness for light, and light for darkness; Who put bitter for sweet, and sweet for bitter! Isaiah 5:20. Likewise, there are those who live with an uncontrolled sexual appetite craving for the next sexual escapade rather than extensive times of prayer and intimacy with God. Because the carnal mind is enmity against God; for it is not subject to the law of God, nor indeed can be. So then, those who are in the flesh cannot please God. Romans 8:7-8. While the practice of stoning is not practiced here in America, it is practiced elsewhere in the Muslim world (Fox News - Two Men Stoned to Death for Adultery in Iran). As we continue to see our world change in such a way that brings us closer and closer to the return of Christ, being stoned to death would seem like a more preferred form of punishment, rather than the wrath of God that abides upon those who continue to disbelieve that Jesus Christ is the only way to the Father (John 3:36, 14:6). Anyone who has rejected Moses’ law dies without mercy on the testimony of two or three witnesses. Hebrews 10:28. Herbert Danby, translator, The Mishnah (New York: Oxford Univ., 1983). Being stoned to death may seem like a walk in the park compared to the eternal darkness and seperation and whatever other punishments are in store for those that reject the Savior. I'll pray for all those in such danger that they will hear and believe the sweet saving sound of the gospel..and believe. excellent! Thank you for sharing your scholarly work on this subject. I have bookmarked this site and hope to learn more. God bless your studies and ministry! Hi, Kurt. Thanks for sharing your work with us! One thing that hit me while reading your post was the number of judges required for a capital offense: 23. I remember serving on a grand jury when I lived in NY, and the jury was 23 people. It seems 23 is not the required number for all states, but it seems to be the maximum across the board. In any case, it is an unusual number - and I was just thinking how interesting it is that so much of our current judicial system seems reminiscent of the Bible's. Thanks Kurt for sharing this information. Very interesting to understand the actual meaning of stoning and to why people were stoned. Sounds like you're plowing through your studies and enjoying them at the same time. All is well with us. God is Good and His mercies endure forever! I'll continue to pray for you each morning. Be good my friend and may God continue to bless you and keep you.